Stay on Prospect for approximately 2 blocks to the Prospect Place/Coast Blvd split, and keep to the left of the median. The church is on the right, one block away. If you miss the Cave Street turn, you may take the next left, Ivanhoe Avenue, and the church is a block away on the left. For free parking, see the parking directions below. Turn right onto Ivanhoe (the first right after La Valencia Hotel). The church is a block away on the left. 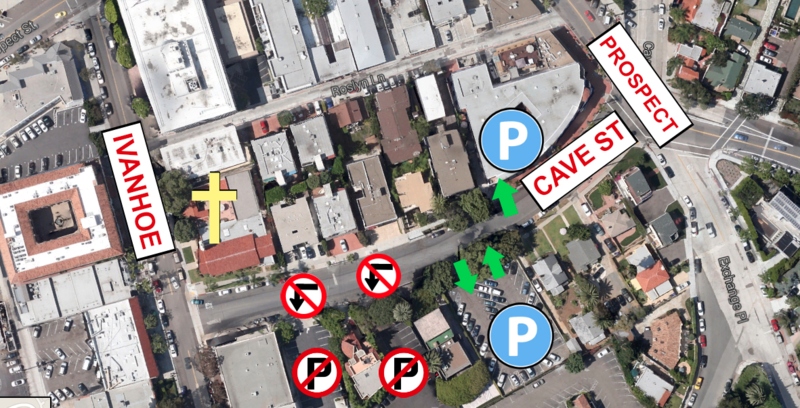 For free off-street parking, wait and take the next left (Cave Street) and follow the parking directions below. On-street parking is free on Sundays and the weekday time limit is waived. There is a handicap space directly in front of the church on Ivanhoe. When turning onto Cave from Prospect, the first lot on the right (an underground garage) and the first lot on the left (a street level lot) are free with a “Congregational Church” placard. Just place the placard on your dash, and you can stay till noon. On the map below, paid lots are marked with “no parking” signs—if you park there without paying, you will be ticketed (the owners of these lots make no exceptions for handicap permits).